This course is designed to provide students with the methodology and expertise necessary to explore and conduct research in the tropical forest canopy. The course involves a hands-on approach to the techniques necessary for accessing the canopy as well as lectures on various topics relating to climbing techniques, safety while climbing, facilitation of climbing activities, and combining scientific research with climbing. This course is the equivalent of the Basic Canopy Climbing Course, the Canopy Access Technicians Course, and the Facilitators Course, all done back-to-back over a four week time period. Certification at each of these levels will be awarded to those completing the course and receiving a passing grade on the examinations. The first week will consist of orientation, introductory climbs into the canopy, and the Basic Canopy Climber Course, during which students will be introduced to, and practice, basic methods for both single rope technique (SRT) and double rope technique (DRT) climbing. Techniques for initial access into the canopy will also be introduced. Students will be climbing into the canopy every day. There will be classroom meetings each evening to cover lecture topics, debrief the activities of the day, discuss safety issues, and acquaint students with the activities for the coming day. By the end of this first week, students should be able to select a tree in the forest, get a line into that tree, rig for a climb in the tree, and make the climb, demonstrating familiarity with both basic DRT and SRT technique and the safety issues involved with such a climb. The second week will consist of the Canopy Access Technician’s Course, during which students will be introduced to more advanced methods of climbing into the canopy and will be encouraged in their development of a personal style of climbing. The course is designed to take students beyond the basic styles of climbing and encourage the use of a variety of techniques as demanded by the challenge of the climb at hand. Creative thinking is encouraged so long as such thinking is contained within the parameters dictated by safety protocols. Students will continue to climb into the canopy each day and there will be some climbs done at night. Students will also be expected to participate in a blindfolded climb. Classroom meetings will continue each evening for lectures, debriefings, and discussion of safety issues. By the end of the second week students should be capable of going into the forest in the absence of the instructor and safely conducting a climb into a previously unclimbed tree. At the end of the second week, students will have a three-day break for a trip to Boquete in the central highlands. An optional cloudforest climb during this break can be made by students wishing to do so. 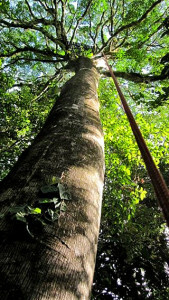 The third and fourth week will consist of training in the facilitation of climbs, rescue techniques, and building confidence to the extent that canopy climbers will be comfortable enough to conduct research while involved with climbs into the vertical environment. Students will also be introduced to the concepts of team climbing, incremental climbing, and the issue of risk management. Students will be asked to facilitate climbs made by others who have never climbed before in order to demonstrate their ability to teach the techniques that they themselves have been using. Students are expected to attend all climbs, classroom meetings and lectures. During the Basic Canopy Climber period of the course, students will be expected to complete a skills check-off list. An exam will also be given for Basic Canopy Climber certification. All students are expected to participate in all activities including night climbs, rescues, and the facilitation of beginning climbers. Students should keep a log of their climbing activities. Log sheets will be provided. Required text consists of the three books listed below. Aspiring canopy researchers should also take a close look at those books listed in the “Recommended Reading” section. Jepson and Flowers’ books should be purchased and brought along with the student. Maher’s text will be available at ITEC. Vines, Tom and Steve Hudson (1999). High Angle Rescue Techniques. Mosby Publishing, St. Louis, Missouri. Priest, Simon and Michael Gass (1997) Effective Leadership In Adventure Planning. University of New Hampshire, Concord, New Hampshire. Elsewhere on this website is a list of recommended equipment for students. 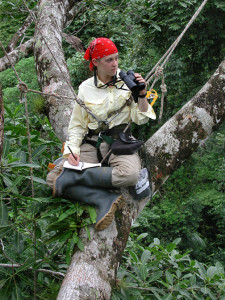 In addition to that equipment there are a few items of gear needed specifically for climbing trees. Light cotton work gloves or gardening type gloves. One pair of safety glasses. Plastic are OK. Goggle-type preferably. ITEC does not require helmets. If you desire a helmet, then you should bring your own. Any personal climbing gear of your own that you wish to bring. ITEC will have all the climbing gear that is necessary for the techniques taught in the course but you may have personal gear that you prefer to work with. Day 1 Arrive via flight from Panama City. Orientation lecture. Day 2 Orientation with the station and trail system, lecture. Day 3 Introductory climbs. DRT in the morning, SRT in the afternoon. Lecture. Day 11-13 Mid-course trip to Boquete and the cloudforest. Day 14-26 Facilitation training, climber rescues, blind climbs, night climbs, team climbs, incremental climbing, evening lectures and debriefs. Day 27 Major climb. Presentation of certifications. End of course party.